A gender neutral, sheep-themed nursery for our baby girl with a few girly elements. A mix of old and new, classic and modern elements were used to create a practical, budget-friendly nursery with a cozy feel. I fell in love with Pottery Barn Kids’ chamois lambie crib bedding, which was the inspiration for the entire room. We wanted to create a gender neutral nursery with soft green walls and we added a few girly elements when we found out we were having a girl. Very budget friendly with a mix of classic and modern elements. I wanted the room to be calm and cozy, but at the same time fun and inviting. I wanted to combine some modern elements with some classic nursery touches. - The crib bedding is Pottery Barn Kids chamois lambie collection, purchased on ebay for a steal. The set even included the 4 basket inserts, mobile and valance. - The crib is Graco Sarah, purchased from Sears with gift cards from my in-laws. - The Sleep Sheep hanging on the crib and all other sheep stuffed animals were gifts from family and friends. 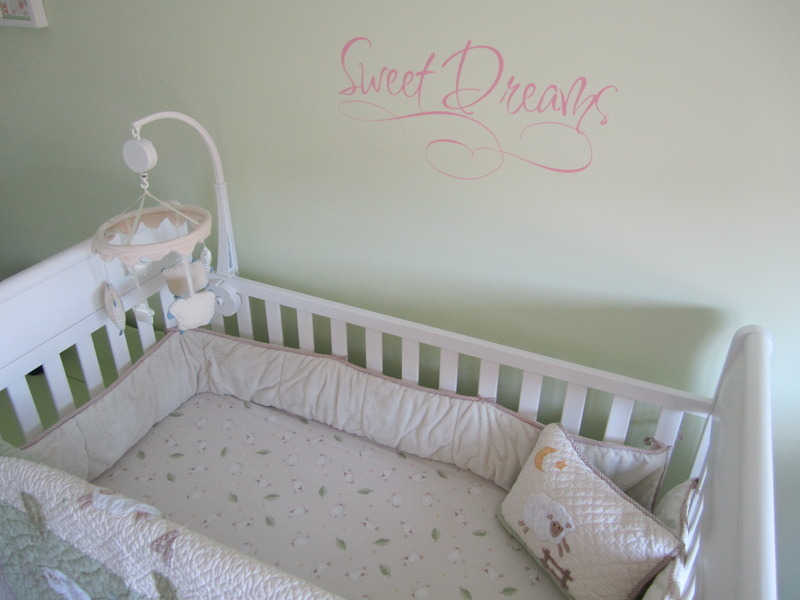 - The "Sweet Dreams" pink decal over the crib is from etsy. - The toybox was built by my Dad when I was a baby. We put a fresh coat of paint on it (Benjamin Moore Potpourri Green 2029-50) and an alphabet decal from etsy. - The 4 paintings above the toybox were custom ordered from etsy (alchemy request). I inserted them in reused white Ikea Ribba frames from our wedding last year. - The glider and ottoman are Storkcraft from Sears, purchased by my parents as our Christmas gift. - The white nightstand was part of my childhood set, revamped with a fresh coat of white paint (Benjamin Moore Cloud White OC-130) and a new handle from Lowe’s. - The small table lamp on the nightstand was purchased on clearance from Pier 1 Imports. - The clock on the nightstand was a steal from Ikea. - The wall shelf above the glider is an old shelf from Ikea from my old student apartment. - The puppy and Smurfette stuffed animals on the wall shelf are my husband and I’s favorites from our childhood. My husband gave me the penguin stuffed animal on one of our first dates eight years ago. - The rocking horse was found in a neighbour's pile of garbage. My Dad fixed it up with new eyes, saddle and hair and now it looks brand new! - The bookcase is an old Ikea bookcase from my old student apartment. - The white dresser was also part of my childhood bedroom set, washed and styled with new handles from Lowe’s. - The drawer dividers are from Ikea. - The baskets throughout the room are from Pottery Barn Kids, to fit the inserts I got with the crib bedding. - The change pad and covers are from Babies R Us, purchased with gift cards. - The Precious Moments painting on the wall was done by my aunt. It was a shower gift. The bedding, the rocking horse, the painting, and the general feel of the room when you’re sitting in the rocking chair. My inspiration guide was the crib bedding, which was the first item purchased for the room. I wasn’t going for a matchy-matchy look, but when everything came together, it all matched much more than I expected. Oh well! I love the look of the wall paint in the sunlight, when it’s very bright and cheery, and at night under the warm nightlight, where it looks very calm and relaxing. Don’t get too caught up in trends. I wanted the nursery to be very practical and not overly put-together. So lovely! Very calming nursery. I like the dominantly green color scheme. And there’s a Precious Moments painting on the wall, too. I love Precious Moments! But you know what the best thing about this nursery is? It’s the fact that you put it together using gifts, old stuff, budget finds and Etsy. This exact shade of green is always easy on the eyes and always has a calming effect to the senses. I also like your choice of sheep as theme. I already have quite enough of the usual owls, elephants and giraffes. And yeah, I love the idea that so many people are involved or have contributed to creating this charming little nursery for your little one. Full-time working Mommy to a beautiful, happy little girl.